What materials did the Project Mastery sites develop and implement during the pilot period, and to what extent did their efforts align with the defining features of competency-based education? What were the key tensions or challenges that emerged in the implementation of competency-based approaches? Among students exposed to the Project Mastery pilot programs, how did their self-reported learning experiences vary within and across programs? To what extent did students' exposure to competency-based education models predict their academic performance in mathematics, reading, attendance, or promotion to the next grade? In 2011, the Bill & Melinda Gates Foundation created the Project Mastery grant program to support competency-based education initiatives in large school systems that serve a high proportion of disadvantaged youth. Competency-based education meets students where they are academically, provides students with opportunities for choice, and awards credit for evidence of learning, not for the time students spend studying a subject. The Foundation asked RAND to evaluate these efforts in terms of implementation, students' experiences, and student performance. 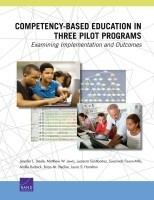 This report presents final results from that evaluation, offering an overview of competency-based education and the Project Mastery grant projects and describing the implementation of competency-based educational features under each project. The report concludes with six lessons for policy, partnerships, and practice. Each Project Mastery grantee emphasized different aspects of competency-based education. Some placed greater emphasis on student choice and project-based learning, while others focused on flexible pacing and evaluation for proficiency. Sites faced challenges in determining how to provide credit for out-of-school activities, including afterschool activities and travel-based learning experiences. Sites experienced tension in holding all students to a common definition of proficiency and evaluating students strictly based on performance, not effort. Sites faced challenges in providing enough computer hardware so that students could use new competency-based curricula or in identifying funds that would permit expansion of new curricula beyond the pilot initiatives. Sites reported that students with weak academic backgrounds may require extra support under competency-based models. Because the programmatic details of the Project Mastery sites were varied, one striking finding was the similarity of students' self-reported experiences across sites. The highest student reports of engagement, flexible pacing, and choice came from a site in which respondents were focused on yearlong, self-directed projects that applied academic content to real-world contexts. Effects of competency-based models on student learning appeared most positive in programs that put primary emphasis on student choice with project-based learning. However, the research design did not permit causal inference, and these findings could be at least partially due to students' or teachers' selection into the programs. Competency-based education programs should be assessed on a variety of near-term and longer-term outcomes. In a competency-based system, flexibly timed accountability tests may provide better measures of progress than fixed, annual tests. In collaborating with technology developers, schools should negotiate favorable terms and anticipate technical challenges. Collaboration between sites and funders should consider local infrastructure and capacity. Increased student autonomy calls for engagement through skillful teaching. Competency-based education systems must be vigilant about equity. Jennifer L. Steele, Matthew W. Lewis, et al. The research described in this report was sponsored by the Bill & Melinda Gates Foundation and was produced within RAND Education, a division of the RAND Corporation. Steele, Jennifer L., Matthew W. Lewis, Lucrecia Santibanez, Susannah Faxon-Mills, Mollie Rudnick, Brian M. Stecher, and Laura S. Hamilton, Competency-Based Education in Three Pilot Programs: Examining Implementation and Outcomes. Santa Monica, CA: RAND Corporation, 2014. https://www.rand.org/pubs/research_reports/RR732.html. Also available in print form.